Asom Gana Parishad (AGP) on Wednesday took out a rally – Shankhanaad – against the Citizenship (Amendment) Bill, 2016 at Dibrugarh in Upper Assam. The protest rally started from Old Government Boys’ High School field with participation of a huge number of party activists. All the senior members carried Shankha (conch shell) with them during the rally to show their opposition against the Citizenship (Amendment) Bill, 2016. 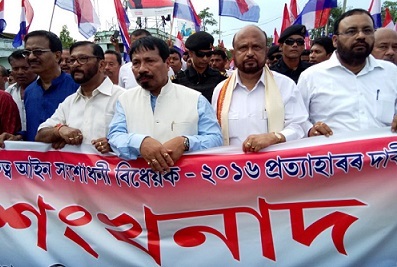 Ex-Chief Minister Prafulla Kumar Mahanta, Agriculture Minister Atul Bora, IT & Water Resources Minister Keshab Mahanta, Food & Civil Supplies Minister Phani Bhusan Choudhury, party leaders Birendra Prasad Baishya, Kamala Kalita, Hiranya Konwar and other AGP MLAs were participated in the rally. The protesters holding placards and banners marched through the main streets of the town and culminated at the Chowkidinghee field. The protesters raised slogans to withdraw the Bill. The Citizenship (Amendment) Bill, which was tabled in the Parliament in August, 2016, seeks to give Indian citizenship to religious minorities, other than Muslims, from Bangladesh, Pakistan and Afghanistan in India, who have come to India till December 31, 2014. “We are against the Citizenship (Amendment) Bill, 2016 because it will have an adverse impact on the Assamese society. The BJP-ruled Central Government is planning to bring Hindu-Bangladeshis in Assam, which is a threat for the indigenous people of Assam,” said IT and Water Resources Minister Keshab Mahanta.